Parking in a structure is the quintessential private good. It is excludable (no pay, no park), and it is rivalrous (if I park in a space, you cannot). Someone at Metropolitan State University does not understand this, and is instead trying to get all employees and students to pay for a parking structure at the St. Paul campus, whether they use it or not (transforming this into a club good). The attached images show the memo of the proposedpolicy. So if you take the bus to the Midway campus (nowhere near the main St. Paul campus), you still subsidize parking in St. Paul. If you pay for parking in downtown Minneapolis and walk to the Minneapolis campus via the Skyways, you will subsidize a parking ramp in St. Paul. 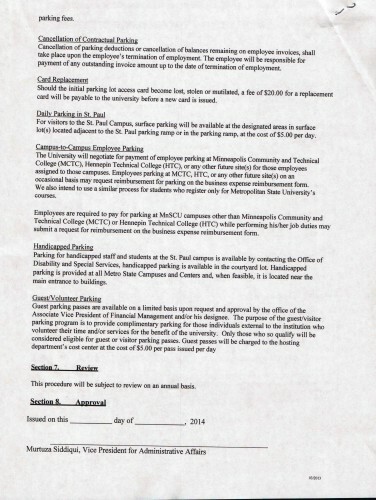 If you take an online course (distance learning), you still subsidize parking in St. Paul. Leaving aside the urban design aspects for now (see below) and the creation of a fortress campus, this is so misguided from an economics perspective I don’t know where to begin. 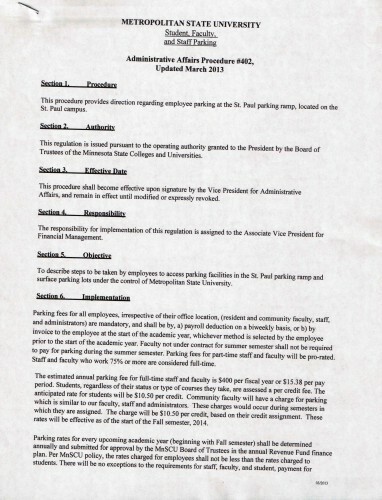 (1) Why is Metropolitan State University in the parking business? Is this a core part of their mission? Shouldn’t they contract with someone to build and operate the ramp and charge parkers (students and staff) market rates? If they need to subsidize staff to work where it is more expensive (or lose people), they can pay them more. (I realize other universities have parking as well, but they charge users directly, and don’t charge non-users, since parking is profitable.) If they lose students from their St. Paul campus, that might indicate they have a bad location. (2) Why don’t they charge people who want to buy parking contracts directly, or charge people who use it on an ad hoc basis directly, instead of charging everyone? The incentives they are creating will encourage more people to drive to campus rather than fewer. (3) Why doesn’t Metro State have a subsidized transit program (like U-Pass) for their staff and students? (4) Why doesn’t Metro State work with Metro Transit to coordinate service with class schedules. The longer-term plan seems to be providing BRT or LRT on the Gateway Corridor, with a stop at Mounds Boulevard (on either 3rd or 7th depending on which alternative is picked), easily accessed from campus. (5) If the neighborhood is concerned about student (or staff) parking on public streets, why don’t they start putting meters on the street (maybe exempting residents who pay for a seasonal pass), and make some money for the neighborhood. Parking benefit districts are a logical and positive response to parking spillover. Now to the urban design aspects. Metropolitan State almost has a quad (with a driveway in the middle, but that is easily remedied). It actually has nice architecture on the St. Paul campus. Why muck that up with a parking ramp? You could see from their existing surface lot how the campus might naturally extend across Maria Avenue, and later across Bates Avenue. If you must build something, do it underground rather than wasting precious above ground space that could be used for better purposes. Stored cars need no natural light. Yes, parkers should pay for parking. No, non-parkers should not pay for parking. No, parking costs are not the same everywhere, nor should the prices be. No, St. Paul does not require more parking ramps. Disclosure: I have a family member who is an employee of Metropolitan State University. These views are my own.